My original Glowing Skin Kit Post is one of my all time most viewed posts ever! 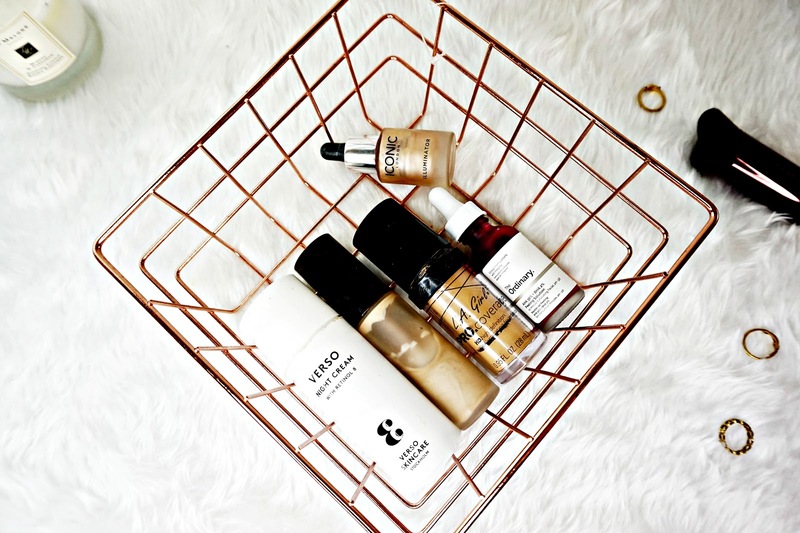 It's over 2 years old now and while I still love some of the products in that post my 'Glowing Skin Kit' has changed. So I thought I'd give you an updated version. I still stand by that skincare is so important in achieving a good glow. If your skin is naturally glowing it will show through your makeup. Here are my favourite skin products for a good glow. This night cream is a holy grail for me. If you want glowing skin overnight you need this. It contains Retinol which encourages the skin to renew itself, revealing, brighter, younger more glowing skin. This isn't a harsh Retinol treatment though, it doesn't sting but this really works! The first time I used this I was completely wowed. This moisturiser is also super hydrating and leaves my skin feeling plump and hydrated. Plus this has all the anti-ageing benefits of Retinol. This is a much more intense AHA treatment that you can really feel working on the skin. This works in just 10 minutes and leaves my skin so soft, smooth and glowing. I can't stop stroking my face after using this. In the long term this also helps improve the skins overall texture and appearance. I'm actually on my second bottle of this because it's so amazing. This is like glowing skin in a bottle. Plus this is so cheap. I actually featured this in my original post and it's a long standing favourite. It's one of the most gentle yet effective AHA toners out there. It gently exfoliates skin, leaving it looking brighter, smoother and more glowing. This is gentle enough to use everyday. Definitely one to check out. I have dehydrated skin and glowing makeup just sits way better on my skin than any other types of finish. It's just a bonus that it happens to be my favourite type of finish. I featured this in my first post too and it is still my favourite primer for giving my makeup a good glow. What I love about this is it doesn't make my skin or makeup look oily or shiny, just naturally glowing. This looks shimmery once you first pump it out the bottle but it's not at all on the skin. It just gives it a nice healthy radiance to it. If you have really good skin you could probably wear this alone. For glowing foundations that have good coverage, last all day and make my skin look overall perfected I've not found better than this. This just blends so easily and seamless into the skin while looking fresh and radiant. The coverage is medium to full. It doesn't cling to any problem areas either. If you have dry or dehydrated skin I really can't recommend this enough. These drops have been a glowy skin game changer, they're amazing. They can be used as a primer, mixed with a foundation or as highlighter. I personally love them as a highlighter. They give my cheek bones the most amazing dewy look to them but in such a natural way. The skin just looks seamless but to glowy. I have a the shade original which is a classic Champagne Gold colour. I think this would be suitable for my skin tones but there is a lighter and a darker one available. There are my favourite products for achieve glowing skin. Have you tried any of these? What are your glowing skin favourites?